News Americas, RIO, BRAZIL, Weds. 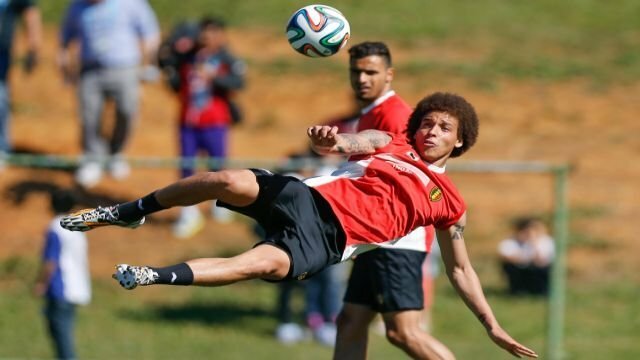 June 18, 2014: Axel Witsel, the son of Martinique-born footballer, Thiery Witsel, made Belgium proud Tuesday as he helped the team to a 2-1 win over Algeria in the Group H match-up of the FIFA World Cup in Brazil. Axel Witsel during the 2014 FIFA World Cup on June, 2014. Axel, a defensive mid-fielder for the squad, tried to score twice in the first half of the match – in the 21st and 34th minutes with powerful 25 yard shots. He also protected the team from Algeria by protecting the back four and won numerous aerial duels. The Red Devils, who had not appeared at a World Cup for 12 years but have been called dark horses, however, did not score until the pair of substitutes helped overhaul a one-goal deficit deep into the second half. Subs Marouane Fellaini and Dries Mertens helped close seal the deal for the Belgians Tuesday.